Pex and Moles is new testing and code analysis technology that is created by Microsoft Research. Pex is powerful tool that helps you analyze your code, detect error situations and generate parameterized unit tests. In this posting I will give you quick and illustrated overview of Pex. I ported views of my ASP.NET MVC application from ASP.NET to Razor. Although Razor is very new it is very promising view engine because of shorter and cleaner syntax. In this posting I will show you same view on ASP.NET and Razor view engine. I like Razor one more but what do you think? I am using StructureMap as my IoC container. In my ASP.NET MVC web application I have controller factory based on StructureMap. I found interesting problem – when running my web application on development web server I get ArgumentNullException with every request to some controller action. In this posting I will describe why it is happening and how to avoid it. CodePlex supports Windows Live Writer! I am documenting local community portal that is hosted in CodePlex. Wikis have always been annoying for me when it comes to creating a good content. So, I was preparing for boring evening full of wiki mark-up and messing with good format, manual image uploads etc. But CodePlex surprised me today – it’s wiki supports Windows Live Writer! With ASP.NET MVC 3 RC there is change in IControllerFactory interface. This interface includes new method called GetControllerSessionBehavior(). This method returns value from SessionStateBehavior enum. ASP.NET MVC uses this method to find out how to handle session for given controller. I am upgrading local community portal from SharePoint Server 2007 to SharePoint Server 2010. I also have to write deployment scripts so other guys can also use our codebase. One thing my deployment script has to do is to force correct master pages to sites. There is one little trick you should know when setting master pages for publishing webs. Here’s how I got things work. This week I visited conference called Sinergija10 that took place in Belgrade, Serbia. Thanks to Microsoft Estonia who organized my trip there! Sinergija10 was very good surprise to me and I am really considering it as one of Microsoft’s top conferences in Europe. Yes, I think it is at least same cool conference as TechEd EMEA. Here is my overview of event and some of my thoughts about Sinergija and communities in area. For guys who are planning to visit Europe events I think Sinergija is event to visit for sure. 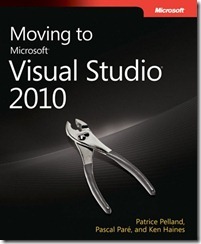 Those who are still using older versions of Visual Studio may find the free e-book “Moving to Microsoft Visual Studio 2010” useful when deciding if it is time to move to Visual Studio 2010 or not. The book is written by Ken Haines, Pascal Paré and Patrice Pelland who all work in Microsoft Consumer and Online Division. I needed a quick’n’dirty way to inspect objects returned from external source. I wrote simple object properties dumping mechanism you can use to investigate unknown objects. It is really quick and really dirty. Some of my readers have problem with detecting correct namespaces to include in code samples. Here is how to get references in place using Visual Studio IDE. When using WCF services you may get the following error: "The maximum message size quota for incoming messages (65536) has been exceeded. To increase the quota, use the MaxReceivedMessageSize property on the appropriate binding element." This error is given because of size limits set to responses in your application configuration.